This thread is dedicated to the memory of Ken Burt (1960-2011). He was a great friend to those who knew him, a dedicated supporter of this site, an incredible artist and craftsman, a very competent machinist, and a skilled author who described his projects in amazing detail. Most of the members of the metal shaping community never had a chance to meet this incredible gentleman but everyone recognized his skills, willingness to help others learn by sharing what he had learned, and the excellent documentation on the projects that he posted. He never asked for anything in return. There are not many people in this world that were like Ken. Ken Burt (Kenb on the site) was a very special person and member of the metal shaping community. He joined AllMetalShaping on 05-08-2009 and was a dedicated contributing member from that time. His generosity and willingness to help other members learn by sharing what he had learned about metal shaping was fantastic. The skill he learned over the years, the projects that he made and documented in such detail helped everyone. His attention to detail in his projects was incredible. 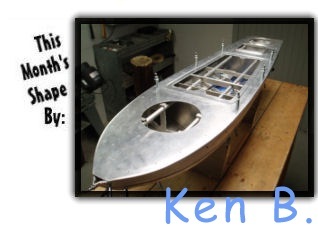 To help people learn more about metal shaping Ken would host events at his shop. Here is a picture of the participants at one of the events. He also built some of the equipment that he used to make his incredible projects. Ken was ready for "Prime Time" with this project. He entered it and was accepted into a major art show. Here is a link to the art show and what he was doing to get ready for displaying his art. My vase is going on a road trip. Some of his personal and internet friends are trying to make this happen for him. He also built an aluminum ball cap that was special to him. He also made some copies and had offered them for sale. Ken's last project was building a 1929 Ford Model A grill shell. Here is a picture of Ken using the bead roller he won on a part for the grill shell and a link to the thread on the build. He entered and won the contest sponsored by Baileigh Inc. and was awarded one of Baileigh's bead rollers as the grand prize. Here is a link to his entry in the contest. This project also indirectly spawned a powerful new tool that will forever bear his name...the 'Burt Buck'. In his Triumph Chin, Ken used thin aluminum strips to support body filler which he then sanded to shape so he could pull flexible shape patterns. This idea lead to others covering the strips with metal tape and making the flexible pattern off that for a rough shaping aid. It also helps with visualizing the final shape. Wonderful tool that was a direct result of Ken's documentation. Ken was truly one of a kind. His passing was unexpected and was a shock to everyone. He will be missed by all who knew him personally and indirectly through his internet work. Last edited by jhnarial; 08-08-2011 at 03:35 PM. Thank you to the operations team for putting this together. Somewhere around here ( or on Metalmeet ) is a thread on how Ken built a beadroller. That thread shows how deep into this hobby he was. I don't think I've ever seen such detailed drawings outside of an engineering office.